Who talks about giving at the end of February?! The holidays have passed, Valentine’s Day is over, what is left to give? PLENTY in my books! In fact, some of my most favourite types of giving occurs when it’s not the ‘have to give’ kind of giving. You see something in the store and you just know someone you care about would absolutely love it – and you just buy it for them for no reason. You whip up a tasty delight in your kitchen and it turns out wonderful and you share the extra with an unexpecting benefactor. You see someone that needs a hand and make a spur of the moment decision to offer yours willingly. You read a book or an article or see a video that you know would really resonate with a colleague or friend or family member and you take time to share it with them. You are generous with warm words or tenderness that may land exactly when that person needed to hear them. You praise someone publicly, to their boss, on social media, or somewhere it can be ‘overheard’. You give more than feels comfortable – like a big tip or more time than you can really spare. You help or give before anything is asked of you. 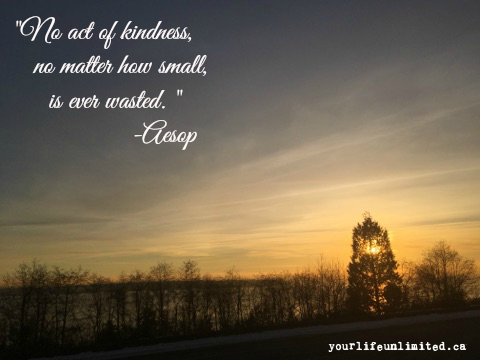 You pay for the order of the car behind you at the coffee drive-through or some other anonymous good deed that no one will even know what you did.March is just around the corner and personally I think it would be cool to make this an unconventional month of giving. Just because I want to, not because I feel I have to, not because I feel pressure to, not because society makes me feel like I ‘should’. Giving for no ‘reason’ – my favourite kind and it’s one more way to live Your Life, Unlimited. Recently on 680 CJOB, I had a lovely chat with an inspring and talented photographer, Rodney S. Braun. I also chatted with wonderful author and speaker, Bob Burg. Take a listen and be inspired! This entry was posted in Blog, Empowerment, Happiness, Personal Growth, Positivity and tagged Inspiration, Motivation, personal growth, positvitiy, Stephanie Staples, Your Life Unlimited. Bookmark the permalink.